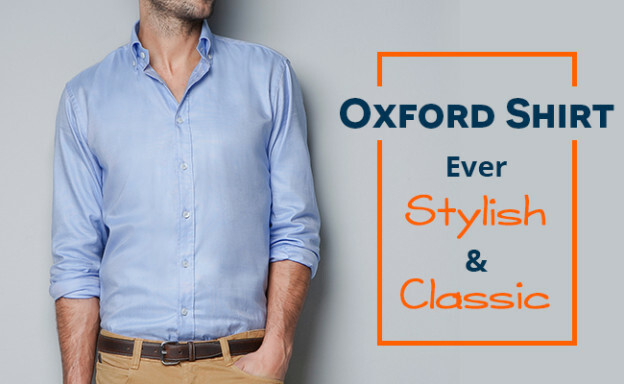 Oxford Shirt- Ever stylish & classic! Ever stylish and classic, oxford shirt is a timeless piece that never goes out of style no matter what the occasion is. To begin with, the formal look, go for the combination of an Oxford shirt, fitted trousers, a watch, a belt and formal shoes. Color co-ordinates the shirt and the tie. But when you are in doubt you can pick a solid color tie instead of some pattern. Make sure to match the belt with the shoes in both texture and color. If you are going for a date or for a social gathering. Pair your Oxford shirt with your trousers and a blazer. Avoid wearing the tie and leave the top button open. For a business casual look, this would be appropriate where the dress code of your workplace is neither too lenient nor too strict. Style your Oxford shirt with a fitted blazer and a pair of chinos. Keep your shirt untucked. For the combination, you can pick and choose the chinos and blazer whether in same color combination or in the constrasting pattern. For the semi-relaxed look on Friday's , team your shirt with a pair of khakis neatly roll up your sleeves. Prefer untucking your shirt with top two buttons open for a swagger look. When we talk about the casual denim look you can go for a slim fit jeans or denim. However, you can go for some other color but eventually blue suits every outfit. Make sure you select the perfect one. Wear your Oxford shirt under a round shape shirt either V or U-neck. But leave the buttons undone. It's always fun to experiment with your look. Hope you try some of these mentioned ideas.